Economical cycles and demographics point down over the next few years. In my Global Forecast published in Financial Sense 21st of August 2009, I pointed out that the spending wave for the US and Europe (incl. Eastern Europe) has topped relative to the rest of the world. The peak was around 2007-2008 and the trend will be down until 2024-2025. In this article I analyse major economical cycles and show how they fit into the declining demographics in the western part of the world. The Russian economist Nikolai Kondratieff was the father of applying cyclical activity to economics in modern times. In his book "The Major Economic Cycles" published in 1925 he identified economical long waves in western countries. According to Kondratieff, the capitalist societies rise in long waves of approx. 50-60 years. Each cycle consists of three phases: expansion, stagnation, and recession. In his theory a new cycle arises from the ashes of the previous cycle and thus the process repeats itself. His conclusion of a new rise in the capitalist economies was not appreciated by Stalin and therefore in 1928 he was dismissed from his post as the director for the Study of Business Activity's institute in Russia. Later he was sentenced to hard labour and finally received the death penalty in 1938. Joseph Schumpeter, an Austrian economist in his book "Business Cycles" published in 1939, named the cycles, "Kondratieff waves", in the honour of the economist who first discovered them. Schumpeter's famous Theory of Economic Development was published when he was 28 and in 1911 he was granted a professorship in economics at the University of Graz. He became the minister of finance in Austria in 1919. With the rise of Hitler, Schumpeter left Europe and the University of Bonn, where he was lecturing (1925-1932) and immigrated to the United States. In that same year he accepted a permanent position at Harvard University, where he remained until his retirement in 1949. Kondratieff identified the following cycles using nineteenth century price behaviour considering wages, interest rates, raw material prices, foreign trade, bank deposits and other factors. 1790 – 1849 first Kondratieff. 1850 – 1896 second Kondratieff. Some divide the Kondratieff wave into four seasons, Spring (improvement), Summer (acceleration and prosperity), Fall (plateau) and Winter (decline and depression). The first stage of expansion and growth, the "spring" stage forces a redefinition of work and the role of participants in the society due to new inventions, new products, new participants and other productive forces. The result is a new wave of prosperity led by entrepreneurs bringing about social shifts, upheavals and displacements which lead to possible revolutions and wars. This gives birth to a new social, political and economic order. In the next phase, the "Summer", there is a rising mood of prosperity and affluence that changes the general attitude towards work in the society, leading to inefficiencies, rising complacency and decadence. After this stage comes the season of deflationary growth, or the plateau period. The popular mood shifts toward stability, normalcy, and isolationism. Unemployment begins to rise. Finally, the "Winter" the stage of severe depression in which businesses go under, the rise in unemployment and debt liquidation leads to deflation in assets and prices. Old institutions that have become obsolete and hinder progress may go under during the shake out. 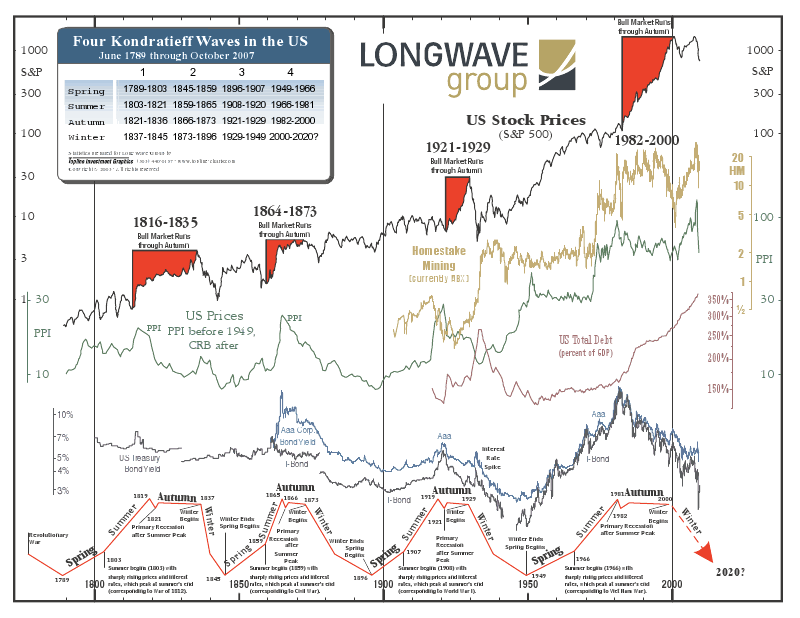 Source: The above chart from The LongWave Group illustrates The Kondratieff Cycle through the centuries. On average the cycle is approx. 54 years long. This time the cycle is much longer. The graph also shows the comparison of interest rates and wholesale prices which are more or less following the same cyclic period. The 8.6 year PI Economic Confidence model. Source: Princeton Economics. Martin Armstrong discovered the 8.6 year PI Economic Confidence Model that has predicted many Economic Confidence crisis. The 8.6 year PI Economic Confidence cycle is expected to bottom in June 2011 and 2020. Notice how well it predicted the bottom in 2002 and the top in 2007 on a year basis. The Benner-Fibonacci cycle is based on Samuel Benner's cyclic discoveries and modified by Robert R. Prechter jr. to fit the behaviour of the stock market. 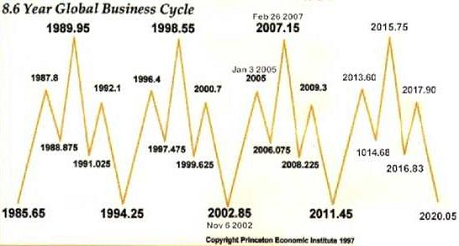 The cycles have rotating bottoms alternating between 16, 18 and 20 years repeatedly. The previous major bottoms of this cycle was in 1933, 1949, 1967, 1987 and 2003. The next major bottom of this cycle is expected in 2021. The major tops rotate between 8, 9 and 10 years repeatedly. The previous major tops of this cycle where in 1937, 1946, 1956, 1964, 1973, 1983, 1991 and 2000. The next major tops of this cycle are expected in 2010, 2018, 2027 and 2037. The 20 year cycle reflects the dramatic stock market lows of 1884, 1903, 1921, 1942, 1962, 1982 and 2002. The next low for this cycle is expected 2022. The 54 year wholesale price and interest rate Cycles. Two of the long term cycles that are expected to be bottoming during the next few years are the 54 year Wholesale price Cycle and Interest rate Cycle. Ideally, these cycles should have bottomed in 2006 but the bottoming is still in process. Our research indicates that these cycles could turn up after June 2011 (The next bottom in the Martin A. Armstrong Princeton Economics 8.6 year cycle). The next ideal top in wholesale prices and interest rates is expected in 2033 and this means that we will have approximately 20 years of rising prices and interest rates ahead of us. In 1947 Edward R. Dewey published a book called "Cycles - The Science of Predictions" which contained a 54 year index of US Wholesale prices going back to 1790 and a forecast for the future. Dewey's prediction at the time was that the next high for wholesale prices would take place in 1979 and the next low in 2006. The predictions were quite impressive for a book published in 1947. What phase of the cycle are we currently in ? You can make a case that the Kondratieff cycle has topped and points down into 2020. A fourth cycle or the current cycle began sometime after WWII (late 1940s) with the spring phase and we are now through with the summer and plateau phase. Assuming that the winter phase of the cycle began around 2000, how can we identify the bottom or the end of the winter phase and the whole cycle ? Schumpeter had the opinion that the decline will continue below the point of equilibrium, and only when the debt structure has been restored to a sound basis will the economy reach this point. However, considering the growing debts as well as the fact that no one has claimed that the debt structure has been restored to a sound basis, we are still within the downtrend phase of the cycle and the bottom is in front of us sometime during the next decade. The reason that the cycle is longer than the previous ones is the reckless economic policy measures of the central banks and governments using enormous credit expansion to finance over investment and over indebtedness. This has prolonged the cycle and at the same time has left the Western world uncompetitive. Their aging populations as well as their over sized civil services means governments will be unable to pay for all the promises they have made. This will bring about the collapse of the economy in these societies in the coming years and thus representing the end of the down phase of the Kondratieff Cycle. The long term cycles mentioned above indicate the 2020 - 2022 time frame to look for the current Kondratieff Cycle to be completed. Demographics for the US and Europe indicate the 2024 - 2025 time frame which is a few years later. However, after 2025 all the long term cycles will have turned up as well as the demographics of the western world so it is very likely that a new Kondratieff Cycle will be in progress that should rise into the second part of the 21st century. The United States, many countries in Asia like India and Indonesia (not China), the middle east and Latin America will have support from very strong demographics during the next rising Kondratieff Wave. Europe and Russia will only have weak recovery as they do not have an echo baby boom like the US. How to take advantage of the new global trends using the Elliott Wave pattern. The Elliott Wave pattern looks like a full large degree wave structure as you can count 5 waves up starting from the French Revolution in 1784 until the beginning of this century. The message is that a large decline has already begun, the degree (size) of the correction (decline) is similar to the one which took place in Europe between 1720-1780 and later culminated in what is known as the French revolution. In the forthcoming articles, I will discuss what the Elliott Wave patterns mean for western societies and their future in terms of economic and social trends.